It's about a wild black horse who becomes friends with a little boy. That's all I'm going to say about the book, you will have to read the book and find out what happens to the horse and the boy. OK, so I know this series is quite fairy tale-ish, but most of the books have a lot of information packed into it as well! 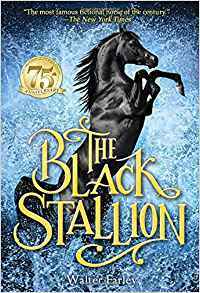 I read most of the series, and when I read The Black Stallion Returns, I put the book down with a burning desire to be a Bedouin in the mountains written of, to even be Alec. To see those beautiful, beautiful horses bred for years and years to absolute perfection of speed, heart, courage, stamina and conformation. Those horses must truly be beautiful. I do believe they are out there, unknown to any but the Bedouins that have bred them over the years. Most of all, I would just love to be able to help breed and raise more of such horses, and bring some into Canada for us folk over here. Truly no man's eye which wasn't a Bedouin's has seen such a perfected program with such stunning horses! The grueling desert life somehow appeals to me also, does it to anybody else? But yes, I would recommend these books. Very interesting for the younger mind, as I'm 15,and they are a bit below my level. However they are still VERY WELL-WRITTEN AND EXTREMELY INTERESTING AND EDUCATIONAL, WITH LOTS OF HISTORIC FACTS ABOUT ARABIAN HORSES AND THEIR ANCIENT MASTERS, THE BEDOUINS. It is a good book!!! We think the black stallion is really cool! P.S: he's not a little boy he's 13 and yes the movie is good, not perfect as no movie (that is based on a book) can be but still pretty good. I really like the book. Is the movie any good? the black stallion is my favourite horse. I read it and loved it, so read some of the others. They were good too! Very well written. Nothing wrong with the story. Just not my exact favorite. this book is the best if you love beaches and u love picturing or seeing horses galloping in the water. i read this book and it is fantastic, at first i thought that it was boring in the beginning but i didn't give up and i kept reading and i was very suprised it was an incredible book. This is the best movie and book ever. I love how its about a boy not a girl. Brothers always complain about how movies are always about girls. But this one isn't. That's what I love, now my brother is finally watching a horse movie, I am so happy about it. I love how its an adventure, a really good adventure. This the best but I better be going. Love this movie and book and that's what matters. Bye. Bye. I wasn't to keen on the film but I love the book. While the film and the book are a perfect match, what always appealed to me was that it was a boy. Almost anywhere there are horses there are girls, so no one ever hears about boys and horses. This author did a whole generation - and future generations - a favor by staring a boy as a lover of horses. This is one of my favorite books of all the horse books I've ever owned! I love black horses, and I have one black horse named Witch. I have this book and I loved it! The first of a 19-book series by author Walter Farley. The Black stallion is the story of a young boy and a wild horse, the only two survivors of a ship wreck, stranded alone on an island, their friendship, and return to civilization. The reading level on this book is quite easy (I believe I read it in 4th grade), but it is still a high-quality story with a good author. I read the book for a school project. And after that i read the whole series. I recommend this book for people who likes an adventure story and who love horses.